...and receive your check in less than 10 days! Consignor Registration for SPRING 2019 will open March 6th at 8am. You will also be able to view the Helper Schedule and select shifts on March 6th. Consignors (sellers) earn 60% back on their sold items or 70% if they help at the sale. Helping just 4 hours at the sale gives you 10% more! A $10 Consignor fee is taken out of the consignor's earnings once the sale is over--so no up-front costs! Yay! Consignors receive a presale pass to shop early & one for a friend to shop the consignor presale on Wednesday, May 1st, at 4pm. Consignor presale pass will be given during consignor drop off. Consignors also shop the half-price presale on Saturday, May 4th, at 8:30am (before the public). You can tag your items online anytime using our barcoding tagging system! You can even tag before consignor registration opens! • Too busy to tag? Try our Valet Service (info below)! Schedule this service early as spots are limited and fill quickly. Our Valet Taggers are ready to tag YOUR items! Be a part of your JBF Community and make YOUR JBF event great! Our JBF BFFs (Helpers) make our events possible! Join other smart & savvy helpers who cover shifts in exchange for early shopping privileges and other Helper Perks. We LOVE our JBF Team! The Helper Schedule will open on March 18th at 8am so mark your calendar! You will be able to view the shifts available and select your shifts then. The more you help, the earlier you shop the Wednesday night presale. Helpers who consign will receive 10% more on sold items (5% more if using our valet tagging services). Helpers shop the Wednesday Presale (see presale schedule). Helpers shop our Half-Price Day (Saturday) an hour before the public. We provide snacks & drinks to all helpers during helper shifts. You may drop off your items at any time between 10am and 7pm (no appointment needed Tuesday). 2. Bring your signed Consignor Agreement, Car Seat Checklist/Waiver if consigning car seat, booster seat or base) and Crib Waiver (if applicable). 3. A friendly JBF Helper will greet you and give you further instructions. You will place all items where they belong on the sales floor, so please plan to allow at least 30-45 minutes for this process depending on how many items you are selling. 4. Drop off will close promptly at the posted times. Please plan to arrive BEFORE 7pm. 5. Check out our Drop Off Check List to be certain you are ready. Express Drop Off (extra fees apply): If you’re in a hurry, we can handle drop off for you! Simply drive up at your appointment time and we unload & place your items on the sales floor. Limited Spots available. Request your Express Drop Off appointment here! All remaining items will be donated at 2:10pm to our charity partner, Forgotten Angels. Donation receipts (for tax purposes) will be available at consignor drop off and pick up. Consignors & Helpers shop the bargains first! 6:00pm – 9:00 pm: First-time parents, grandparents, teachers & military (ID required). Visit website to see if you qualify for presale. (No children or strollers during presale (except infants under 12 months of age if in sling or carried). *Photo ID required at entrance for First-Time Parents & Grandparents. Teacher & Military ID or Daycare ID required. Acceptable Items - What Can I Sell? Gather: Diaper bags, infant carriers, backpacks, lunch boxes, girls' purses & breast pumps are great consignment items. Please inspect all items carefully to make sure items have not been stained, damaged, recalled or have missing pieces. Package: When packaging breast pumps, please be certain all accessories are in a clear bag, taped shut and secured to the pump with safety pin or zip tie. If you would like to place high-priced items (over $20) in our High Value Area please see a volunteer at Drop Off for assistance. Price: Price 50% - 90% off retail. Items in great condition & clean tend to sell very well. Tag: Safety pin JBF tag to item or Hole-punch JBF tag and attach it to item with ribbon, string, or zip tie. If item contains multiple pieces, be sure all pieces are included and list number of items on JBF tag description. Gather: Please be selective when selling bedding, blankets, receiving blankets, burp cloths, and towels. New and barely used items sell best. Check carefully for stains; shoppers get very disappointed if they find a stain in a bundled blanket once they get home. JBf sells bedding in size bassinet through full if appropriate for babies and kids. No "adult style" bedding sets will be accepted. Package: Put bedding/crib/bedroom sets together in original packaging or in large clear plastic bags. Please note JBF Houston South does not accept crib bumpers (unless they are mesh) for safety reasons so please do not package them with bedding sets. Arrange bedding sets inside bag so that shoppers can see all of the items as well as the design/pattern. Secure the bag so that items do not get separated. Bundle blankets, cloths, and towels with ribbon or string like a package (be sure multiple pieces cannot be separated). Tag: If bedding is in a plastic bag, attach tag securely with packaging tape to the inside of the bag with printed side of tag facing out so shoppers can see it. Tape the bag shut so tag shows. If bedding/blankets are bundled with string, attach tag directly to blanket and tuck it under the ribbon/string so that it does not easily get pulled off when shifting around during the sale. Gather: Books, book sets, board games, puzzles, video games, video game systems, scrapbook, arts & crafts sets are great items for resale. Please only bring kids’, parenting, homeschooling, pregnancy and child rearing books. Games and puzzles must have all pieces. (No "adult" content please.) Check items to ensure they are in great condition. Package: Use clear, self-seal bags or clear cling wrap (saran wrap, NOT PRESS & SEAL as this may pull off an items paint or color) to hold multiple items together; Tie sets of books together with ribbon/string. Be sure that parts/games to video game systems (such as Vtech) cannot be separated or switched out at the sale. Price: Prices can range from $.50 to $50 in this category, depending on the item. Price to sell especially for books & DVDs as there are always lots to choose from at the sale. If you would like a high-priced item placed in the High Value Area near Checkout, please see a helper during Drop Off. Tag: When tagging books, please attach your tag to the book with blue painters tape that can be removed without to damaging the item or use clear packaging tape (can damage some types of books when removing). Tape tag to the outside cover of glossy books and to the inside cover of books that will easily tear when removing the tag, Please do not use masking or double sided tape. Hole-punch JBF tag and tie to sets. Gather: Children's clothing Newborn through size 20 and name brand girl's junior size items (Abercrombie, Hollister, Roxy, American Eagle, Nike, Burton preferred brands) as well as maternity clothing (only current styles & not older than 5 yrs). Our Fall Sale is fall & winter clothing only (what your child would wear between October-March) but we accept swimsuits year-round. Be picky. Look at your clothing items as if you were going to purchase them. No stained or damaged items will be accepted. Any items that look like "mom's" clothes will be rejected at inspection. Please freshly clean your clothing items. Replace missing buttons, sew loose hems and seams, and clip loose threads. Please button all buttons, snap all snaps, zip all zippers before you arrive at drop off. This will ensure that there are no defects in the clothing. The newer the item looks (and the better it smells), the better it will sell. Package & Hang: Hangers - Please hang clothes so the hanger hook points to the left (like a question mark). Hang size 0-6 clothing on child-size hangers and sizes 7-20 on hangers that will allow clothing to stay on hanger but not too big for the garment. Hang maternity clothing on adult-size hangers. Clothing that falls off the hanger onto the floor does not sell well. Adult size wire hangers tend to tangle in other hangers so avoid these if at all possible. Clothing Sets: Sets tend to sell better (under size 6) so match things up if you can (pieces should be same size). All garments should be hung with the hanger hook pointing left (hanger should resemble a question mark when looking at the front of item). Attach clothing sets securely with bottom garment hung on the backside so both pieces can be viewed without separating them (this sometimes requires only one hanger but may require two (you can rubber band or zip tie hangers together. Pants/Shorts - Pant-clip hangers are great but you can also use larger safety pins and pin to upper portion of hanger to keep from sliding. Onesies, socks, tights, hats and infant mittens can be placed in a clear zip-lock bag (you may group multiple items in one bag). Please be sure to label your tag well so that customers know what is included.You may choose to hang onesies also (personal preference). Price: Hanging Clothing - As a general rule price at 50-90% off retail. Put outfits/sets together to price for at least $3.00; Start at $3 for basic, generic brand 0-24mo outfit. Add $1 each for larger size, name brand, formal, and heavy/winter. Ok to price for less if not able to make a set or if not worth the $3.00. Of course checking the "reduce" box will help you sell more on half price day! Non-hanging Clothing - Put sets or pieces together if possible and price to sell (i.e., 6 pair of socks nice for $1.00 - $1.50). Tagging Clothing on Hangers: Attach tag with a tagging gun or safety pin to the label of shirt or upper right front of pants. Insert the gun in a label or inside seam allowance and NOT through the seam or part of the clothing (to avoid making a hole or tear in the clothing). Also, gently pull on the tag to make sure it is properly secured and will not come off easily. Please make sure consignor tags are visible from outside of the clothing so customers don't have to search for the price. Tagging Non-Hanging Clothing: Please use safety pins to attach tags to onesies, socks, tights, infant mittens, and accessories. You can also use tagging gun to attach if a tag or seam allowance is present. You can also put these items into clear baggies and seal closed with clear packing tape. Gather: Exersaucers, swings, high chairs, changing tables, strollers, bath seats, baby walkers. Cribs (Manufactured AFTER June 28, 2011 only; please bring Crib Waiver for all cribs). 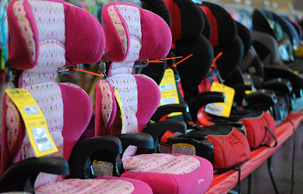 Car seats, booster seats and bases must have Car Seat Waiver for each piece. All items must be checked for safety recalls, must have all parts, and be in good condition. Children's furniture - beds (toddler, twin), desks, side tables, dressers, etc. Package: If item has multiple pieces use packaging tape, zip-ties, or string to keep items attached together. If wooden furniture has loose parts, use clear plastic wrap or large baggies to secure item. All furniture and equipment should be assembled during the sale. Batteries must be included, if applicable. Please bring a Car Seat Waiver for all car seats, booster seats, and car seat bases or infant carriers. If part of a travel system the carrier & base must EACH have a completed waiver. Price: Price 50% - 90% off retail. Items in great condition tend to sell very well. Tag: Attach JBF tag directly to item with clear packaging tape, painters tape or hole-punch JBF tag and tie it to item. You can safety pin tag to fabric on some items, too (such as stroller pad or high chair pad). Gather: Nursing covers & pillows, feeding items, monitors, safety items, diapering & toileting items, rattles, and more. Please check for safety recalls on all items that you consign. Package: If item has multiple pieces use packaging tape, painters tape, safety pins or clear self-seal bags to keep items attached together and clearly visible to shoppers. Batteries must be included, if applicable. Price: Price 50% - 90% off retail. Items in great condition (and clean) tend to sell very well. Tag: Attach JBF tag directly to item, use clear self-seal bag with clear packaging tape or hole-punch JBF tag and tie it to item. Gather: Make sure that shoes are clean, clean, clean. No dirt on the soles please. We will be VERY selective with shoes during Consignor Drop Off & Inspection. Shoes must be current season (Fall = October thru March; Spring = April thru October). Package: Fasten shoes together with zip ties or ribbon or tie the shoe laces together. For infant shoes or small shoes without laces, you may put the shoes in a clear zip-loc bag. We prefer no shoe boxes as these will usually get separated from the box. Price: Shoes must be in good condition and should be priced at 50-90% off retail depending on condition. Tag: Punch a hole in the top of your tag and attach the tag to the shoes with the ribbon, string, or zip tie. For infant shoes in a clear zip-lock bag, put the tag inside the bag and tape the bag shut with clear packing tape or tape to the outside of the bag. Gather: Ride-on toys, block sets, dolls, remote control cars, outdoor toys, learning toys, and more. All toys must be checked for safety recalls before consigning. Clean all toys and baby equipment thoroughly. Please test to make sure that toys and equipment are working properly. Battery operated toys must include working batteries (these can be purchased inexpensively at local discount stores/ dollar stores). Kits can be mailed to you for $5 extra and are usually received within 2 days. WARNING: Please only tag through the manufacturers tag or the inner seam hem (seam allowance) of items. Do not tag through the seam to the outside of your item or straight into the fabric. A hole will form. Tagging guns can damage your items and ruin them if not used properly. Refer to Proper Use of Tagging Guns to avoid damage and holes. If you have questions, please contact melanienewell@jbfsale.com before tagging. Please click here to check availability of kits or to reserve yours. Supplies are limited! No time to tag? Use our valet tagging services and let US do the tagging for YOU! These spaces fill quickly so reserve your spot quickly! If interested, please complete this form and we will be in touch soon with all the details. Consignor Waiver Drop Off Checklist Car Seat Waiver Crib Waiver Acceptable Items - What Can I Sell? I know raising kids is EXPENSIVE! In this economy there are so many individuals and families striving to make ends meet or saving for a comfortable future. JBF can help YOU achieve your budget goals. There's always a treasure awaiting at JBF. It's like having a coupon for 50-90% off everything!